This is my second differentiation post in a series of blogs on this topic. I will continue to add instructional suggestions and examples from my experience. So…How did this happen? First, it was an evolutionary process. As I became more and more familiar with differentiation techniques I became comfortable with trying new and different strategies. As I grew in my understanding of what students needed in order to demonstrate what they knew and understood I found that I needed conversation with each student about the content. I also, had to get better at asking questions. Some of my units involved student contracts. (I will share some of my ideas about this in a later blog). Contracts involved students spending time on numerous activities where extensive input from me wasn’t needed and as a result my time could be better spent on conversations with individual and small groups of students. I had already started formatively assessing student conversations by recording tidbits of our discussions. The next step was summative assessment and it wasn’t as hard as I thought it would be. I shared with the students how the vocabulary test would work. As part of their contract they had to sign up with me for their test. A list of 5 minute segments indicating when I was available over a 3 day period was posted and waited for their signature. The test was given in a specific section of the room. Initially many students listened to the test conversations, but as time continued this occurred less and less. The conversation between each student and I became part of the busy classroom noise that was evident on any given day. The test was on ten vocabulary words that were selected by me with student input from the unit vocabulary word wall. We worked together to determine the words that were absolutely necessary in order to have a complete understanding of the content being studied. Students studied the words in the same way they did for any vocabulary test. I shared with them some of the questions I would ask – How are these words related, connected? Which word is more important? Why? Prioritize the words. Explain your reasoning. To shorten the process I placed the ten words on index cards and laid them face down on the table between the student and myself. The student selected three words that we would then discuss. The word selection was random and this was important to the students which was a response I didn’t anticipate. I discovered that this small amount of student choice empowered the students making the process an immediate success that ran smoothly; there was never a question as to why I picked certain words for certain students. It didn’t matter which three words were selected, with prompting from me, I was able to discover if each student understood all ten words as well as the unit we were studying. Listening to the student responses helped me understand their individual thinking processes and pointed out when and where I didn’t hit the target. After the testing I was able to revisit areas of need and to eliminate misconceptions. I always wrapped up this type of exam with an exit slip that asked: Which words did you hope I would choose? Which words were the hardest? Why? This was a rewarding experience for me. Please share any ideas you have around this topic or ask any questions that would help you get started. 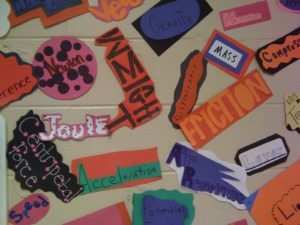 This entry was posted in Blog and tagged differentiation, vocabulary development. Bookmark the permalink.